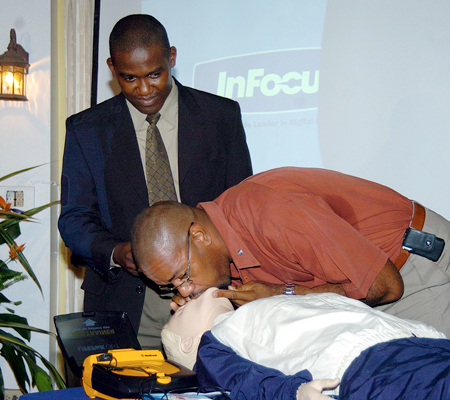 Warren Williams (right), CPR consultant at the Heart Foundation of Jamaica and Gary Mendez, project manager, JNBS Foundation, demonstrate proper CPR techniques during the launch of the Public Access Defibrillation Programme at the Alhambra Inn in Kingston on Tuesday. Caption: Warren,I told you that it wasn't lip balm it's a glue stick. .
Caption: Gary to Warren: Hey suh, a quick deep breaths, nuh long deep kisses! Caption: MAN in the back smirking and thinking, laawd look how willie jaw bone dem a pop out and the dummy naaw response. Caption: tek lesson mi bway, ah so big man dowit! watch an learn!! Caption: My yute yu lucky, no amount a money dem can pay me fi do dat! ! Caption: Man looking on in anticipation: "OOh! Me next, me next! !